Suppose you and your opponent are roughly equal, so that either will tend to score about half the points. Then your chances of winning 11-0 are 1 in 2 raised to the 11th power, or 1 in 2048. (Call it 1 in 2000 for you math phobes.) That means there's about 1 in 1000 chance that any given game will end 11-0 (including times you lose 0-11), though in reality it's more likely since a player could get hot or cold. Now let's suppose you are better than your opponent, and win 60% of the points. (I won't bore you with the math, but it involves 0.6 or 0.4 raised to the 11th or 33rd power, then inverted.) Now your chances of winning 11-0 are about 1 in 276, and your chances of winning 11-0, 11-0, 11-0 are about 1 in 21 million. More scary is that roughly 1 in 24,000 chance of losing 0-11, and (shudder) 1 in 13.6 trillion of losing 0-11, 0-11, 0-11! I just reread "With Winning in Mind" by Lanny Bassham, the classic on sports psychology. I read it - or at least parts of it - back in the 1980s, but had forgotten about it until local player/coach John Olsen mentioned it to me this past weekend and lent me the book. Now I remember that it was the basis for much of the sports psychology for table tennis ideas I've taught over the years. It was also mentioned by sports psychologists at the Olympic Training Center. The book covers in highly readable fashion the interrelationship between the conscious, the subconscious, and the self-image, with systematic ways to develop each through mental management. Bassham, an Olympic Gold Medalist and World Champion in shooting, pretty much shows the way champions thinks, using shooting (and sometimes other sports) as examples. I highly recommend this for any ambitious athlete or coach in any sport. I ordered several copies to give out to some of the top cadets/juniors at our club. To summarize: if you are a serious table tennis player, read this book. Two dogs join in the table tennis action. Because a day without a dog or cat table tennis video (1:09) is like a day without ice cream. Forehand: Butterfly Tenergy 05 FX 2.1 black. This is a soft looping sponge. It allows easy looping without a long, powerful swing. When you loop, the ball just jumps off this rubber with what some call a high throw angle. If you have a more vigorous stroke, you might want a harder sponge. I both loop and hit, but my hitting is more natural, so I go for a sponge that props up the loop since I can hit with anything. This sponge allows me to run down hard shots off the table and loop them back with good spin. The softness does mean less speed, but the consistency and spin offset that for me. Another sponge that does this (which I used before) was JOOLA's Energy X-tra. Backhand: Roundell 2.1 red on the backhand. This is perfect for my basic hitting and countering backhand, and you can also loop with it pretty well. (I generally only loop against backspin on the backhand.) It plays like glued-up Sriver, which is what I used on my backhand for many years. Another sponge that does this (which I used before) was JOOLA's Express One. Hardbat: I use an old TSP blade that I bought at a tournament back in 1990. It's a one-play pure wood, and I don't think it's made anywhere, so there's no point in trying to match it. I use Butterfly Orthodox on both sides. Here's a nice article on Will Shortz (NY Times puzzlist), Robert Roberts, and their new full-time table tennis center. Here's a rather interesting table tennis photo. Why not come up with your own caption for it? To the talk show hosts on both extremes who have split our country, and the idiots who listen to them and vote, and all those who forget that the Founding Fathers compromised . . . great job. The Apocalypse won't be biblical, but economic. I also disagree with #3, about not copying other coaches. I'd say you should copy what works, and expand on it to make it even more successful. To use a classic example, when the Europeans began dominating the Chinese in table tennis in the early 1990s, the Chinese copied their two-winged looping game, expanded on it, and have pretty much dominated the game since. If they hadn't done so, where would they be now? Still playing with pips-out? I'm also slightly skeptical of #6, which says not to use the same programs over and over and over. It's partially right, but what works before often will work again, in the same situation, as long as you understand why the program worked before, and make any needed adjustments. For example, many pro athletes have very specific habits that prepare them to play their best. There's no reason to not use the same program over and over and over - if it works. At the same time, as the situation changes you might have to make adjustments; for example, older athletes might need more stretching to avoid injury as their muscles tend to be tighter. Adoni still didn't like the pictures I put up of him two days ago, and when an actor from "24," Hidalgo," "Troy," and "Mortal Kombat: Conquest" talks, we sometimes vaguely listen when not hitting ping-pong balls. Yesterday he emailed me, writing "I thought I would include a pic where I didn't look pregnant and/or feminine in any way." He sent me this one and that one. Now we get the real Fayed Abu sinister look! Here's all-time great Waldner showing his ball-bouncing abilities! (0:32) His opponent is Jorgen Persson (1991 Men's Singles World Champion); the second announcer speaking is five-times U.S. Champion Dan Seemiller. Yes, that's what I weighed this morning. On Dec. 26, 2010, I weighed 196. Despite all my fame and fortune, my goal of becoming a nobody is rapidly becoming a reality. This should strike fear in all my opponents who used to move me around, especially all the kids at the club (many of whom I coach) who used to think it was funny to move me side to side. Try it now! On to 165. YesterdayI got a major "nibble" on my YA humorous fantasy novel, "The Giant Face in the Sky." The agent - from one of the large NY agencies - wrote: "Well, this is a weird one, but the mere prospect of a buddy comedy where one of the buddies is a meteor is cracking me up, and you’ve got great comic timing, to boot…would you send me the full manuscript when you get the chance? Much obliged!" Here's an article on the San Francisco ceremony, with lots of pictures. Pictured are former Chinese stars Cai Zhenhua and Liang Geliang, San Francisco Mayor Edwin Lee, former Secretary of State George Schultz, and former USA star Judy Hoarfrost. I've been discussing with club members the idea of starting a tutoring service at the Maryland Table Tennis Center. We have so many kids coming in for lessons each day, so why not turn MDTTC into an all-service table tennis and tutoring center? They could bring their homework, and we'd find someone at the club who could be available for tutoring. Oh, that latter would be me!!! (I'm qualified to tutor math, English, and a few other subjects.) While I've tutored before, I've never done it in a formal setting, so I'm not sure of the best setup. Do I do it one-on-one on a case-by-case basis? In a group setting at scheduled times, such as Mon-Thu 4-6PM? How much to charge? If anyone has experience in these matters, let me know, either by commenting below or emailing me. Thanks! You thought you were just having fun, and it turns out you've been out for a walk! Why isn't she rated? She plays at and co-owns the Spin Club in NY! Here are some of my more interesting spontaneous coaching lines at the U.S. Open last week. "Make no attempt to stay near the table." "She's dropping your short serves short, and looping your long serves. So serve in between." "You have nothing to lose, so just serve and loop everything." "He's twice your size and looks like a football player, but you're the better athlete." "Stop ripping winners and spin the ball." "Turn off your brain and just attack." "I'm not throwing in the towel." "Are you sure you want to counterloop that?" "He has a great forehand counterloop, but only fishes on this backhand. I'd go to his backhand." Outside table tennis I write science fiction & fantasy. I just sold my 50th short story, "Running with the Dead" to the Through the Eyes of the Dead II anthology. The story: Ben just wants to try out for the high school track team as a miler. The problem is he's dead, and the captain of the track team, the leader of the Mile Mafia, is the one who murdered him. (I write about 50-50 between science fiction and fantasy.) Here's my complete listing of published articles - 1274 in 120 different publications, including 1173 on table tennis. Under 1950: Cameron Siou (1930) over Jeremy Hazin (1631). Under by 20 and (gulp) 319 points. Under 1800: Marina Leitman (1811) over Edmundo J. Lozada Salazar (1759). Over by 11 and 41 points. Under 1650: Natasha Carr-Harris (1535) over Alex Bu (1530). Under by 115 and 120 points. Under 1350: Rohan Mannem (1283) over Paul Scobey (1267). Under by 67 and 83 points. Under 1200: David Stone (1167) over Wilson Chen (1209). Under by 33 and over by 9 points. Under 1000: Anton Berman (641) over Michael Gustafson (798). Under by 359 and 202 points. Someone's a bit under-rated? And just for the record, the fearless Gustafson, with the 798 rating, also played Under 800 but didn't reach the final - but he did get revenge on the girl who took him out of Under 800, beating her in Under 1200. Under 800: Anton Berman (641) over Wang Yee (756). Under by 159 and 44 points. I wrote yesterday about some of the problems with hidden serves. One irony I didn't mention is that often a player doesn't even notice when an opponent hides his serve. Like all other shots in table tennis (at least for a well-trained player), you don't consciously react to shots. Your subconscious reflexively reacts to the various incoming spins. So when returning a serve, it's the subconscious that's actually reacting. When the serve is hidden, the subconscious doesn't see contact, and so often misreads the spin - but the conscious mind doesn't always notice since you don't normally consciously react to the contact. A well-trained player learns to blank out his conscious mind while playing, and so doesn't consciously see contact unless he makes an effort to look for it. Of course this doesn't change the fact that at the higher levels, many players hide their serve and most umpires don't call it, so for now, players will just have to learn to read hidden serves by watching the ball, as players used to do before hidden serves became illegal. Funniest part of the U.S. Open for me was watching opponents struggle with Sun Ting's ("The Sun King") serve. Whenever he serves, it's showtime as opponents miss shots all over the place. The problem isn't so much that they misread the type of spin as they misread the amount of spin. How he puts so much spin on the ball without seemingly doing so is a mystery that only Albert Einstein might have solved. Alas, Sun Ting lost 11-9 in the seventh (from up 3-1), 4,-2,-4,-11,9,8,9, in the quarters to Canada's Pradeeban Peter-Paul. Sun Ting has been at my club, MDTTC, for the past month, and will be here for another month. He defeated Ma Lin in a tournament a few years ago, and had a 2730 rating from the 1999 North American Teams, when he was 15. The players I coached had up and down records; unfortunately, we were 0-5 in five-game matches this time around. Have to work on that. Because I was mostly coaching or playing hardbat, I didn't see many big matches, and so can't report on them. My Hardbat Results at the Open - skip if not interested! While I was there primarily to coach, I did enter three hardbat events. (I normally play with sponge.) I had to default out of Open Hardbat because it conflicted with the junior team competition. I've won that event twice at the Open and Nationals, and while I probably wouldn't have won it, I had a good chance to do pretty well, maybe make the semifinals, and after that, who knows? I made the final of Over 40 Hardbat. (I've won this four times at the Open or Nationals, including the last Nationals.) In the preliminaries, I had to play Peter Cua, one of the top Philippine hardbat players. He had me 16-11 in the third (two out of three to 21 in hardbat), but I went on a hitting binge and won ten in a row. (I told myself to just take the shots and let the shots happen, and they happened.) 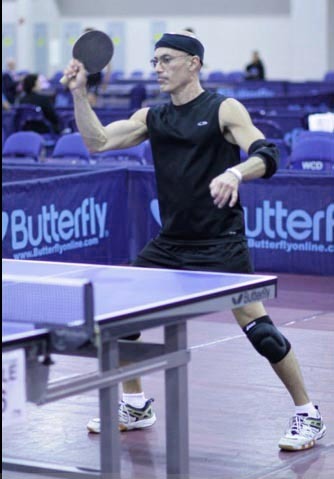 I had another huge battle with Jeff Johnson in the semifinals, who as usual ran me all around the court in a battle of his steadiness versus my forehand hitting/backhand chopping, and despite a near comeback by him late in the second game I won two straight, 15 & 16. In the final I played Richard Gonzalez, but his forehand hitting and heavy & varied backhand chopping was just too much, and he won easily, 13 & 11. I think I may be able to take on his chopping in a rematch, since I'm good against that, but it had been a while since I'd played a hardbat chopper of that level - but if I had, he'd have just attacked more, and his attack was way too strong. The guy was a member of the Philippine National Team and I believe is their hardbat and sandpaper champion. I also played hardbat doubles with Ty Hoff. I've won that event ten times, six times with Ty (including at the last Nationals), and we did pull off a nice win over Dan Seemiller Sr. and Jr. - I had to smash Dan Sr's loop from down 19-20 match point in the second to deuce it! - but we lost in the semifinals to Jeff Johnson and Scott Gordon. They in turn lost to the Philippines, Richard Gonzales and Joseph Cruz. Those two pretty much dominated all hardbat play. This week's Tip is about Coaching Against Yourself. It's short and to the point. Unfortunately, Sharath Kamal, like many others, doesn't always serve legally. Here's a video of him on Youtube from the 2010 Egypt Open - it's not easy finding videos that give the right angle so you can see if the serve is hidden. See his serve 29 seconds in. Here is a four-sequence screen shot of the serve, showing how it disappears behind his body. At the 2010 U.S. Open, he and many of his opponents served illegally, hiding the ball (and especially contact) as they served, but umpires rarely call this. Notice how with the arm stuck out, it's easy to thrust out the shoulder and hide contact. If the player pulls the arm back, as the rules require, then the shoulder isn't naturally thrust out, and if the player does thrust the shoulder out while pulling the arm back, it becomes rather obvious. This is what happened at the U.S. Open a few days ago when, at the request of the players I was coaching, I twice had to call an umpire against the same opponent because he sometimes stuck his arm and shoulder out, thereby hiding the serve. (This led to a very unhappy parent; hopefully he and I can put aside our disagreement on this so as not to be a distraction to the kids. After all, if the serves are legal, then there shouldn't be any objection to having an umpire.) The opponent may not even have been aware he was doing it, but the umpire warned him immediately to pull his arm in - on the second serve after the umpire came to the table - and the rest of the way the serves were pretty much all visible. Rule 2.06.05: "As soon as the ball has been projected, the server’s free arm and hand shall be removed from the space between the ball and the net." Rule 2.06.06: "It is the responsibility of the player to serve so that the umpire or the assistant umpire can be satisfied that he complies with the requirements of the Laws, and either may decide that a service is incorrect." Rule 2.06.06.01: "If either the umpire or the assistant umpire is not sure about the legality of a service he may, on the first occasion in a match, interrupt play and warn the server; but any subsequent service by that player or his doubles partner which is not clearly legal shall be considered incorrect." Many players push the service rule to the limit - which in itself is okay in most cases - but they serve with the ball so close to the body, with the arm or shoulder thrust out, that it's difficult to tell if the ball was actually hidden or not. Many forget that a "tie" goes to the receiver, i.e. if the serve is not clearly legal, then it's supposed to be a warning or a fault, even though many umpires don't call this. (See 2.06.06 and 2.06.06.01 above.) So when a player serves with the ball so close to the body, or with the arm or shoulder stuck out, and the umpire can't tell if the serve was visible or not, then he's supposed to give a warning and then a fault. But many umpires do not. Some umpires enforce the rule about the arm being pulled out of the way, but then ignore it when the player continues to hide the ball with the shoulder, even when it's seemingly obvious. On the other hand, illegally hiding the serve is so prevalent at the higher levels, since umpires usually don't call it, that many coaches believe you should just accept it, and learn to return such serves, while (at least publicly) saying you shouldn't do them yourself. The problem is that it doesn't take that long to learn (or teach) illegal hidden serves, but it's extremely difficult these days for a junior to learn to return hidden serves effectively because they are against the rules, and so if the junior trains in a junior program, he won't see hidden serves unless the other juniors are being trained to serve illegally. So he only sees them infrequently at tournaments. As he reaches higher levels, he sees them more and more, but by then he's already been trained to read the spin of legal serves, and now has to almost start over, when of course to really be able to return these serves at a high level he'd have to start training against them at an early age. Of course a coach could spend his coaching time serving illegally to the student so he can learn to return hidden serves. But since most students only have limited hours of private coaching per week, you can't spend much of that time on that, and it takes a tremendous amount of time to learn to read and return such serves effectively. So what's a coach to do? Call for an umpire every time an opponent serves illegally, thereby causing hassles while often just getting an umpire who will not call hidden serves, and so essentially giving their stamp of approval to the illegal serves? Teach illegal serves to all or most of their juniors so they can both practice against them and use them in tournaments as so many others do, and ignore the fact that it is illegal, and to be blunt, cheating? Or just serve legally, and accept the fact that they will always be at a large disadvantage when opponents do not? I've talked it over with some of our cadets and juniors, and most don't want the hassle, and lean toward just accepting that some opponents are going to serve illegally, and they'll just have to try to learn to return them, and accept that because they serve legally they are at a severe disadvantage. Is this fair? There is currently a new service rule proposal being worked out that may solve the hidden serve problem. I'll post about that later, since I'm not sure if they want to go public yet. Did I mention how good Sweet Onion Chicken Teriyaki is? I introduced USA Cadet Team Member Tong Tong Gong to movie & TV star Adonis Maropis. I'm not sure who was more in awe of the other. Greg Mascialino pulled off not one, but two around the net loops that basically slid on the table - in the same point! The opponent somehow got the first back. 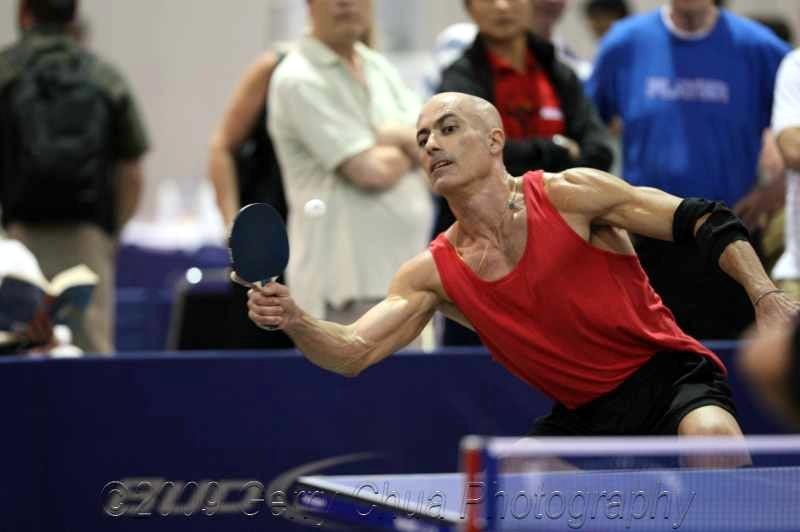 Tomorrow I'm coaching Tong Tong Gong against a top player with the Seemiller grip. FINALLY I get to make use of all my knowledge of tactics against this grip! Sweet Onion Chicken Teriyaki at Subway is very good. Thought you should know. …here's three minutes 45 seconds of spectacular beer pong shots. The playing hall wasn't open Wednesday for practice, so I visited Spin Milwaukeewith Tong Tong Gong, the cadet player I'm coaching at the Open. For $16 we rented a table for an hour of practice. I played great at the start, but toward the end - especially when we started playing points - he came alive and things became far more difficult from my end. Since I'm a coach, that's a good thing, right? Then we went out for mint chocolate chip ice cream. There's a plaque at one of the hotel entrances that declares it to be the site of the Oct. 14, 1912 assassination attempt on Theodore Roosevelt by saloonkeeper John Schrank, who'd been plotting the attempt for three weeks. As an amateur presidential historian, I spent some time reading over the old newspaper clippings on the wall. The hotel was then called the Hotel Gilpatrick. Roosevelt was saved by his thick coat, eyeglass holder, and the 50-page manuscript of his speech - folded over once, so really 100 pages - which slowed the bullet down before it entered his body. Before going to the hospital, Roosevelt read the entire speech, taking 90 minutes. The bullet was lodged in the muscles of his chest, and doctors concluded it would be more dangerous to remove it than to leave it in, so it remained there until Roosevelt died in 1919. Here's a continuous video of a woman playing table tennis in bed by herself, holding one racket in her hand, the other with a her feet. Enjoy! I keep getting accused of coaching during matches at major tournaments, something I've never done. If I clap, they think it's a signal. If I fidget, grin, frown, or so much as breathe, I'm told I'm coaching. The players I coach think it's hilarious when I get warned, but it's rather irritating. It happened twice at the North American Championships and twice at the Nationals. Should I have gotten a haircut before the Open? Twenty years ago there were no full-time training centers in the U.S. devoted to full-time training. So we opened the Maryland Table Tennis Center. Four and a half years ago I made a proposal to USATT urging them to make it a goal to have 100 successful junior programs in the U.S. in five years. The plan involved recruiting and training coaches to become full-time coaches and run junior programs. At the time there were at most ten junior programs in the country that I'd call successful. USATT had no interest. This was a major reason why I resigned all my positions with USATT - editor, webmaster, and programs director. Now we have a number of full-time training centers and junior programs around the U.S. The result is that the competition in junior and cadet events is much stronger than before. Imagine if USATT had taken the initiative by recruiting and training coaches, instead of sitting around and watching while every now and then someone would take the initiative and create such a program, usually having to reinvent the wheel from scratch. (Actually, they learned from each other; I've spent a huge number of hours talking and emailing with coaches and promoters interested in opening such centers and running junior programs, as have others.) If USATT had made this a priority, there would be far more successful junior programs and the competition could have been even tougher - and since I'm coaching there, I'm thankful at least for that. Yep, here's a 40-second video of a penguin playing table tennis. Enjoy.